What it is: An exquisitely rich and highly concentrated anti-aging masque that reverses the sings of aging in weak, very dry and damaged hair. What it does: Formulated with Caviar and a potent blend of antioxidant-rich vitamins, DNA, repairing proteins and ultra-hydrating lipids it deeply penetrates both hair and scalp to nourish and repair while it conditions, moisturizes and protects. Who it's for: For all hair types. Especially beneficial for those with severely damaged hair, color and chemically treated hair or hair exposed to environmental aggressors. - : Helps to regulate sebaceous gland activity. - : Promotes proper protein synthesis, enhancing the follicle’s regeneration capacity to improve and strengthen the hair’s condition. - : Provides excellent hair fiber conditioning and regenerating properties. - : Intense protection, moisturizing and nutrition. -- : Increases keratin formation. - : Immediate hair regeneration. - : Leaves hair silky and shiny. - : Intensely protects and restructures the hair and scalp. 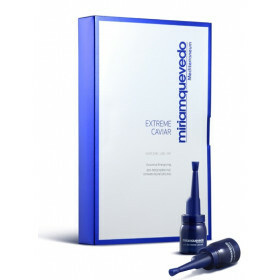 - : Helps penetration and effectiveness of active ingredients applied subsequently. Apply the rich creamy formula to wet hair and scalp, and massage in gently. Comb through the hair, working with downward strokes starting near the tips and gradually moving upwards to the roots. Leave on for 5 to 10 minutes. Rinse thoroughly. 5 Trace Elements Complex: Made up of magnesium, iron, zinc, copper and silicium it provides cells with critical nutrients to ensure strong division of cells and optimal hair growth. DNA: Prevents mistakes in protein formation.